Had to practically destroy it to get to 500kb. Edited by AntMan1, 19 March 2019 - 12:55 AM. Don't see anything but it was likely a satellite or meteor. HI....I enhanced your image to bring out the contrast to be able to see it better. I think 3 secs is too long to be a meteor....I am thinking a dim satellite? Thanks - What's the blue ball at the lower end? EDIT - Its not like any satellite I have seen. Somebody playing with a laser pointer? Edited by Jim Waters, 19 March 2019 - 01:26 AM. Edit: Too slow, heh... Well I'll leave it up anyway. Edited by JoeInMN, 19 March 2019 - 01:30 AM. The END of a meteor trail, exploding high in the atmosphere. Oh, thank-god! The mothership has finally returned to pick me up. They took their sweet time, 50 years on the miserable rock...can't wait to get back home. Are the rest of you from section Z9 all packed and ready to go..good. We'll meet at the designated staging area...think we should warn the inhabitants of this planet about the Asteroid headed...what do mean Humans can read this! Ah, never mind! Clear skies and happy trails....hope I get out before the black helicopters show up! LOL! April fools day...okay, so I'm a little early. But seriously, really cool pic! This could also be a plane. The exposure started or stopped right as one of the lights on it flashed. Weird weird photo... what is the chance of an meteorite exploding? Then again i seen one in the adk mountains years ago... coolest thing i have ever seen. If you're talking about my comment above, this was a 3 second exposure so I doubt there would be more than one light flash. As far as i remember all airplane navigation lights "red and green" are on all the time. I get flashing lights at times in my exposures (yielding 'new' stars). I wouldn't assume the blue would completely blank out the lights if that is where you're going. planes have both strobing and constant lighting. Edited by AntMan1, 19 March 2019 - 09:34 PM. Sorry, I'm just missing what you're trying to say. I've seen similar results in my images from planes and helicopters. That's really all I'm trying to say. I tend to find that about 99% of the times these things are more man-made than meteors and the like. Here is your image processed with a bit more care. It is a unique photo indeed! Wow just wow! are you telling me all that detail was in that original photo? I am convinced it was some type of space junk or a rock burning up in the atmosphere now. Is there any agency that could help tell us what it is? What is your opinion? Edited by AntMan1, 03 April 2019 - 02:54 PM. I’m afraid it is much more likely to be a bright star that either started stationary and then moved out of frame - or it started outside and moved into frame and stopped briefly. The other stars would have done the same thing but they may be too faint to show trails. Images like this that - I think - capture multiple scenes and motions in a single frame do pop up occasionally. 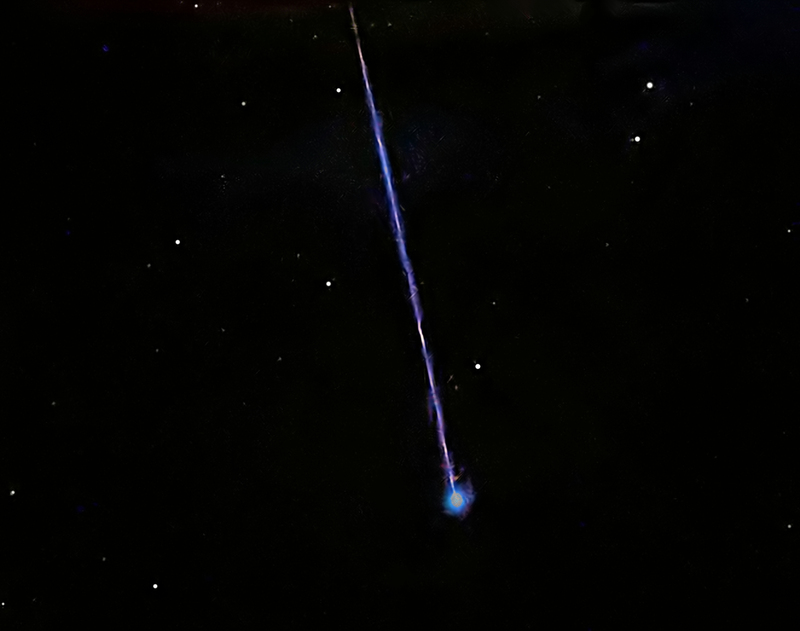 I think the event was a small bolide which exploded high in the atmosphere. Looking at the path, there is evidence of initial entry, heating up, ablation and the final explosion. Some meteors, usually originating from comets, contain substantial proportions of volatiles like ice, dry ice (CO2), ammonia, and methane. When the volatiles in the interior reach high temperature, they rapidly evaporate, expand, and cause an explosion which disintegrates the meteor. 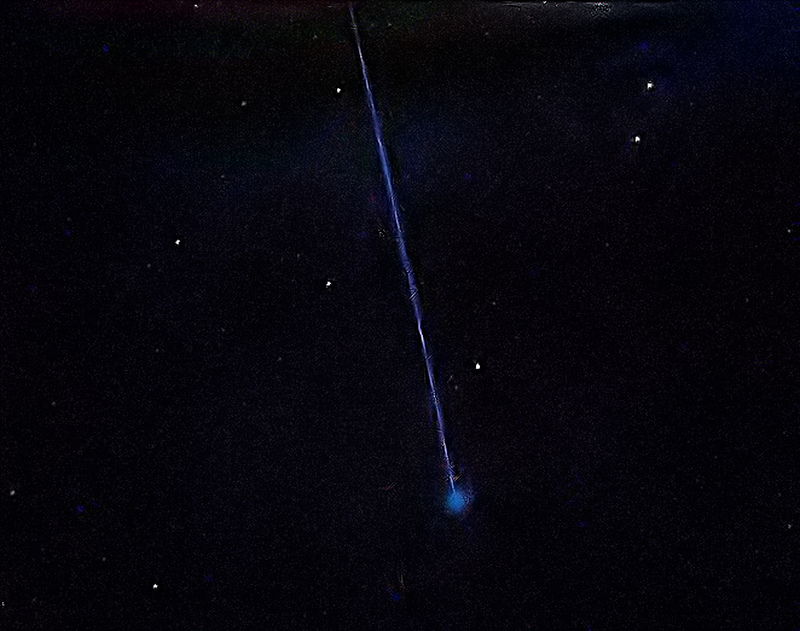 You are very fortunate to have caught the entire event in a random 3 second exposure. I would consider submitting the image to various meteor societies. Thank you for the information. I think this is the best explanation here so far. I tried the other two links but they all go back to the fireball reports fourm. I sent in a UK version. Someone looked at the report and grouped it with one other observer but did not say anything else. At first Robert Lunsford from the American Meteor Society thought it may have been one of the most detailed photos of a meteor he had seen. He shared it with his colleagues and they came to the conclusion below..oh well still a great lucky shot! We have come to the conclusion that this was a satellite or space debris. To cross half of the frame in 3 seconds is much too slow to be a meteor. Meteors rarely last this long and if it did it usually covers ten’s of degrees within this duration. Regardless of what it is, you have captured an extraordinary image. Thanks for sharing it with us!" I don't follow the reasoning there. The frame was a 3 second exposure. 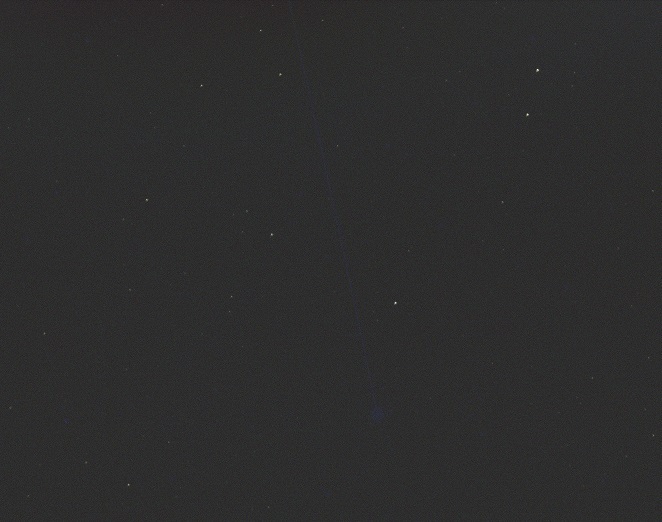 The longest time for the object to traverse the frame and show the full track would be 3 seconds. 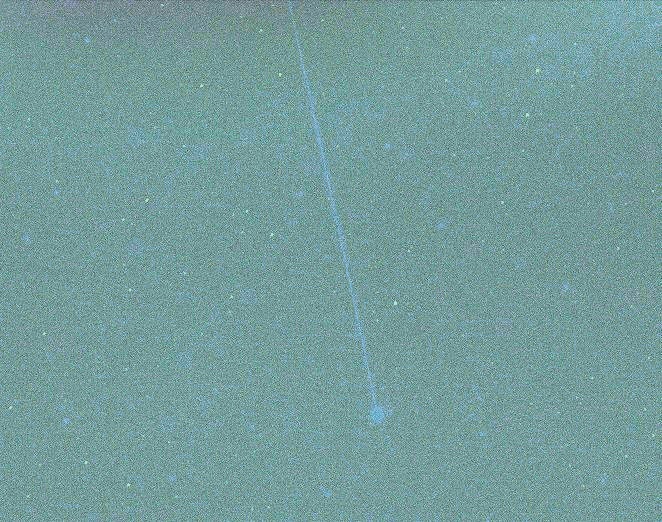 However, a meteor that crossed the frame in 0.01 second during that 3 second interval would look exactly the same as your image. I still think it is a meteor. Edited by jdupton, 05 April 2019 - 07:33 PM. I'm not following Robert Lunsford's reasoning. 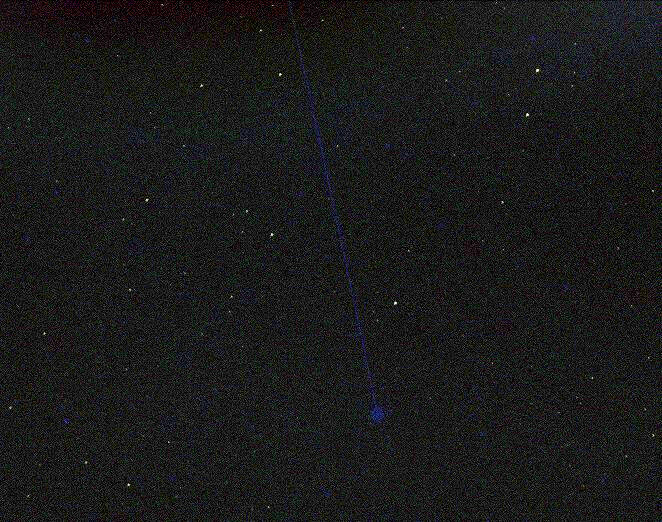 Just because the exposure time was 3 seconds does not mean that the object in question was in the image for that entire time. It could have just been in the image for a tenth of a second.